The success of your email campaigns depends on email open rate. If no one opens your email, then you cannot generate new business from email marketing. So, what is a good email open rate? We share open rate numbers by industry, by device, by out send time and more – all backed by research from 50 email marketing statistics to help you increase email open rates. With our unique case study, we show you how we earn an average 40% email open rate for every single email we send (based on over 99,000 emails sent). Plus, learn how we generated a 94% email open rate! How do you measure the success of your email campaigns? The chances are that you measure the success by the number of people who open the mail (email open rate) and the number of people who click on a link (click-through rate). That’s how I used to measure it. 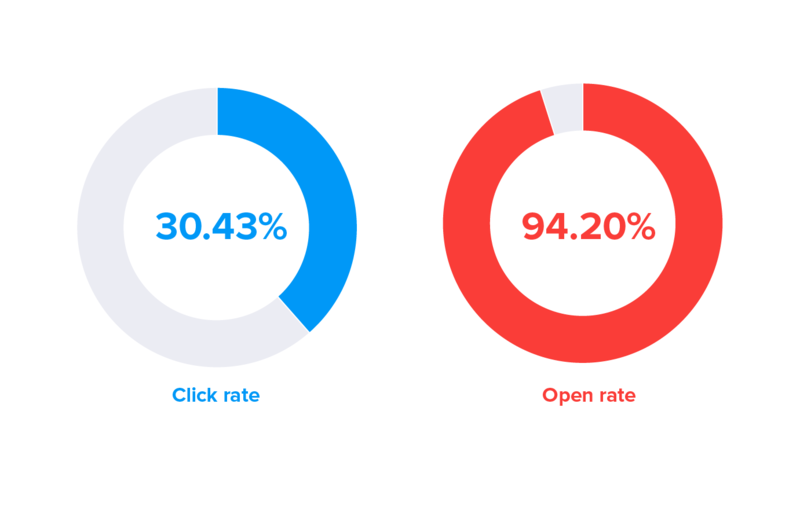 And while there’s nothing wrong with that, what gets overlooked is that the click-through rate is entirely dependent on the open rate, because unless people open your email, there’s no chance they can click on it! Therefore, in order to get a better click-through rate, you need people to open your email. So, how do you get more people to open your email? There’s a lot of opinions on the web about how to increase email open rates, but I’m only interested in the concrete data behind email open rate success. Which is why this article is stacked full of more than 50 email marketing statistics! The science and data presented to you in this article will help you get more people to read your email marketing campaigns and help you increase email open rates, which in turn positively impacts the overall performance of your email marketing strategy. What is an email open rate? Before I dive into the data, you and I need to understand this metric. You see, most people consider the open rate as the number of people who open your email. The reader enables images in your email to be displayed in the preview pane or in a full view of the email. The recipient clicks a link in the email. OK, easy enough. But, how are email open rates calculated? Email service providers (ESPs) calculate the open rate by taking the number of people who open the email and dividing it by the number of emails sent that did not bounce, i.e. failed to reach the recipient. For example, if you send 100 emails, and 10 of them bounce, this leaves you with 90 delivered emails. Of those 90 emails, let’s say that 10 are opened. This means that your email campaign open rate is 11% (10 emails opened from 90 delivered). Emails that are not delivered cannot be opened, which is why this number is not included in the open rate percentage. What is the average email open rate? Given that B2B email marketing has been the most popular marketing channel for several years’ and that the average number of promotional emails sent to readers continues to increase, you would think that email open rate is on the decline. 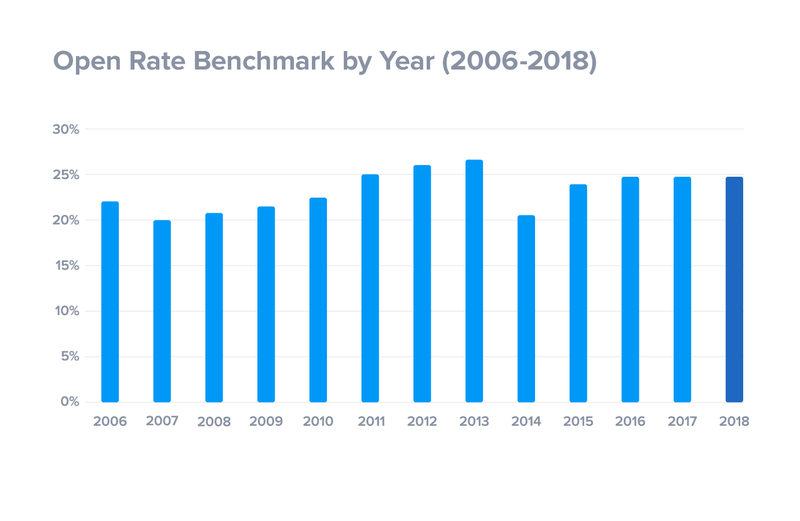 Except for a drop in email open rate between 2013 to 2014, the average open rate for email continues to improve year over year – albeit slowly – reaching 24.88% in 2018 (an increase of 0.3% compared to 2017). This is of course good news as it means that email is still a powerful marketing channel you can use to communicate with your prospects or customers. Before you get more people to read your emails, you first need to understand where you stand. How many people currently ready your emails? What is your current email open rate? This is where industry benchmark open rate reports comes in. How do I compare to the industry average? Benchmark reports are important in understanding of how the industry is changing on the whole and you should find out your own benchmark based on your email campaign performance. You should be able to pull this number from your email service provider. As you can see, open rates differ from country to country. How do your own email open rates compare? In 2018, the average open rate across all industries is 24.8%. If you have an open rate of 25% or higher, then you’re doing great! If not, don’t worry. You know your email subscribers better than anyone else. For example, if you consistently reach a 15% open rate, which is below average yet your campaign is delivering results, it’s obvious that you are not under performing even if the “industry average” says you are. Of course, averages are to be taken lightly. Open rates in the insurance industry, for instance, differ from those in the health care industry. And open rates in Europe differ from those in the US. The first challenge you need to work on is getting your email to your subscriber list. It’s no use spending hours crafting a perfectly optimized campaign if it ends up in your readers’ spam folder, is it? How do I get more emails delivered? More than 20% of marketing emails never make it to a subscriber’s inbox. That’s more than one in four emails! Of course, just like open rate, average deliverabilty rates differ by region. 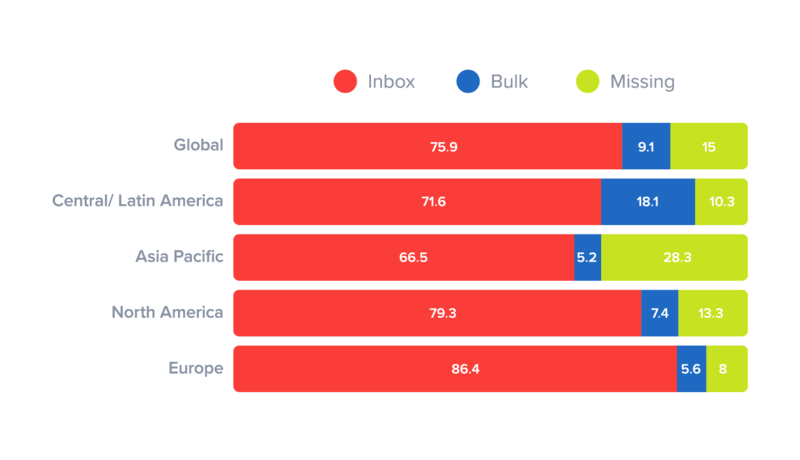 For example, only 66% of emails reach a reader’s inbox in Asia compared to 86% in Europe. This makes a huge difference to your email open rates! So, how can you make sure your emails are delivered to your readers? Here are a few tips on how you can increase delivery rates. Use double opt-in. Double opt-in means that the subscriber will verify that she wants to receive emails from your business (although this not a requirement under GDPR). You don’t want to send emails to people who don’t particularly care about them; otherwise, they will not read them and lower your open rates. Ask your readers to add you to their trusted address book. By simply asking your readers to add the “from” email address to their contact lists, you can increase the number of emails delivered. Cleanse your email list. If a subscriber does not open an email from you three times in a row, the chances are that she is no longer interested in your company. Gmail and Yahoo Mail are smart enough to understand this so if you continue to send emails to subscribers who do not open them, they might be directed to the spam folder, so consider cleansing your list (like JD Whetherspoon did before GDPR). The more emails that are delivered to your audience, the better chance you have of getting more people to open them. How do people read my email campaigns? The way people read emails can provide key insights in how you create your email marketing campaigns. For example, the type of device they read it on. Marketers’ can no longer ignore mobile and tablet devices. 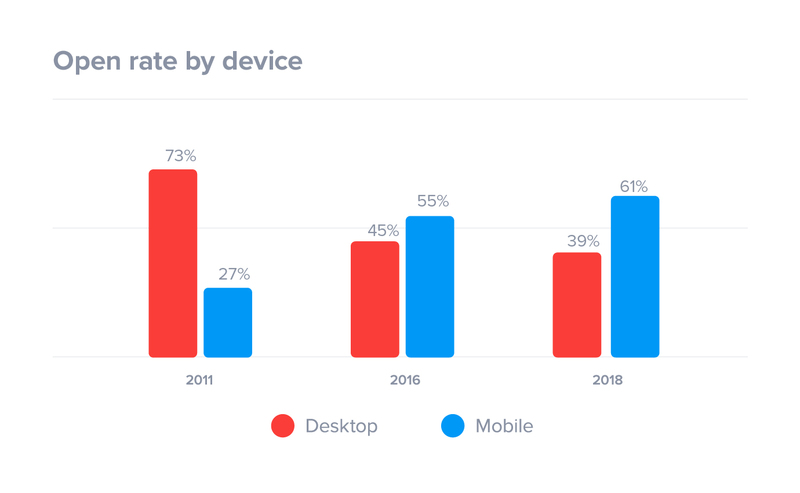 Email open rates from mobile devices have grown by more than 100% since 2011 and the percentage of open rates from mobile continues to grow each year! Today, 61% of all emails are now opened and read on mobile devices. Can you guess what your readers do when you send them an email that isn’t optimized for mobile? They delete it. In fact, 70% delete the email immediately! And yet, only 11% of email campaigns use responsive design to optimize their email layout. Worse still, our own email marketing benchmark report found that only 20% of email campaigns are optimized for mobile devices. Have you seen how your own email campaign template reads on a mobile device recently? If not, you should take a look. If you haven’t optimized your email campaigns for mobile devices yet, now is the time. When should I send my email campaign? Timing is important to open rates. To know when to send your email campaigns, you have to know your audience. If you sell software, most of your customers will be enjoying family time on the weekends. That means sending an email campaign on the weekend will lead to fewer opens, if any at all! So when should you send your email? 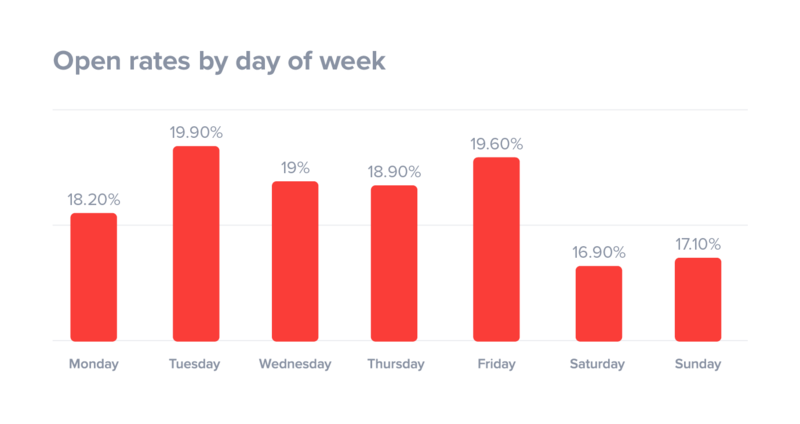 Research by Get Response found that the best day to send emails in order to get the highest open rate is Tuesday. Now that you know on which day to send your emails, what about the time of day? Further research shows that readers are more likely to open emails after 12 p.m. And that 23% of all email opens occur during the first hour after delivery (Tweet this!). After 24 hours, an email’s chance of being opened drops below 1%! 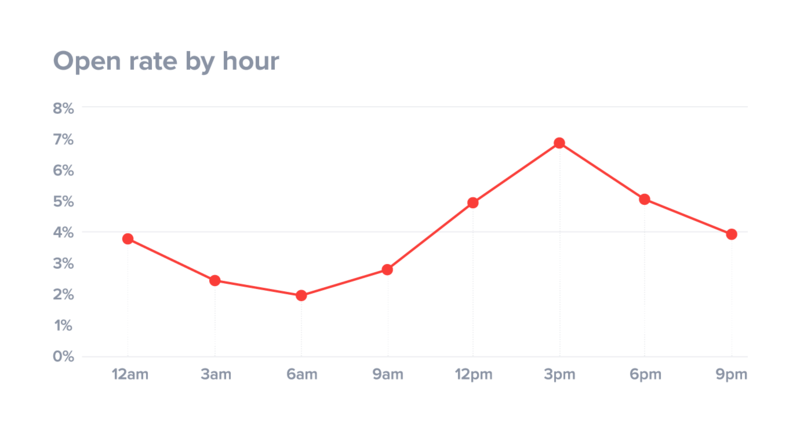 As you see, the timing of when you send your email is crucial to the success of your campaign. If you send it on a day when people are less likely to read your email, then you could be missing out on a lot of interested customers. How do I increase email open rates? The sender name and subject line of your emails are the most important factors in getting them opened and read. For example, 64% of subscribers say they are likely to read your email because of who it’s from, and 47% of email recipients open an email based on the subject line. What sender name do you use? Do you send your emails from company XYZ, or do you use a specific person’s name? Believe it or not, but this can make a huge difference! Research from Pinpointe marketing found that by using a specific personal name, rather than a general email address or company name, you can increase open rates by as much as 35%! Which is why it’s surprising to find that that our own B2B email marketing research found that 89% of email marketing campaigns are sent from a company name. When it comes to subject lines, have you heard the phrase “you should spend as much time writing your headline as you spend on writing the content”? Well, the exact same phrase applies to your subject line. A well crafted subject line shouldn’t be the first thing you think of. Instead, it should take time. And you should use research and data to help guide you. A report by Retention Science found that subject lines with 6 to 10 words deliver the highest open rate, making 8 words an ideal number for a subject line. If a subject line is too long, it will get cut off and your reader will not know what the email is about (and could ignore it). This is especially important for mobile readers as the subject line character length is even shorter! Another reason for opening an email is if the subject line is addressed to the recipient, as subject lines personalized with a recipient’s first name, for example, can lift open rates by as much as 20%! Using a recipients name in a subject line is simple, if you use a CRM. Of course, if you are feeling super creative, you can take it one step further. Retention Science found that subject lines with movie titles and song lyrics have an average open rate of 26% (Tweet this!)! Subject line #1: “Imagine all the people...” got free shipping today! If you link to a video within your email, you can also include the word “video” in your subject line. It’s something we have tested and including the word video increased our open rates by 6%! Are there any words I should use or avoid? By analyzing billions of emails sent and opened, Dan Zarella was able to find out which words to use and which to avoid in the subject line. Most clicked-on emails include these words in the subject line: “secrets”, “e-sales” and “awesome”. Emails mostly reported as spam included the words “confirm”, “features” and “upgrade”. People are less likely to open emails that include a question mark (?) or a hashtag (#). Creating the perfect subject line that includes key words proven to increase open rates, and sending the email from a known sender should now be at the top of your to-do list for when you next send out an email. And you know what? If I was reading this article, I would be thinking the same thing! The good news is that I’ve tested the science. And it works! Earlier in the post, I referenced that the average open rate in 2018 was 24.8%. Using the techniques listed above and based on data of more than 99,000 emails sent during the last 10 months, my average email open rate is 40.9%. That’s right – forty percent! That’s 66% higher then the average open rate. If you’re looking to increase your own email open rates, then try one or two of these techniques the next time you send out a campaign! Earlier this week, I conducted an email campaign test. In the test, I sent two emails. The first email was sent to a segmented list (based on interest) and the second was sent to my main blog subscriber list. The subject line was the same. And the email content was the same. Upon viewing the results, the main blog subscriber list generated my average response of a 40% open rate. The segmented list earned a staggering 94% open rate! The sad part is that 89% of marketers do not segment their email list. Perhaps now is a good time to start segmenting your lists? I’ve provided the science behind email open rates and the ways you can use the data to make actionable decisions about your email marketing. Of course, the best option for you might not be to use any of the above. It depends entirely on what your reports tell you. But you can start with the data provided in this post and use the science to guide you to more get more emails opened. How do you measure the performance of an email marketing campaign? Have you optimized your email campaigns for mobile? Thank you for the kind words, Niraj! Let me know how it works out for you. Awesome information.You put summery of so many scientific researches in one article! Interesting statistics and info Steven. What source is the statistic about "Reasons for opening the an email" from? Hi Jenn, thanks for the comment. Great question! The percentage in this article is accurate at 64% (as in 64% open the email based on who it is from). The HubSpot article features a blue chart underneath their comment (#31) that is taken from the CMB study. The chart shows the reasons why people open emails. 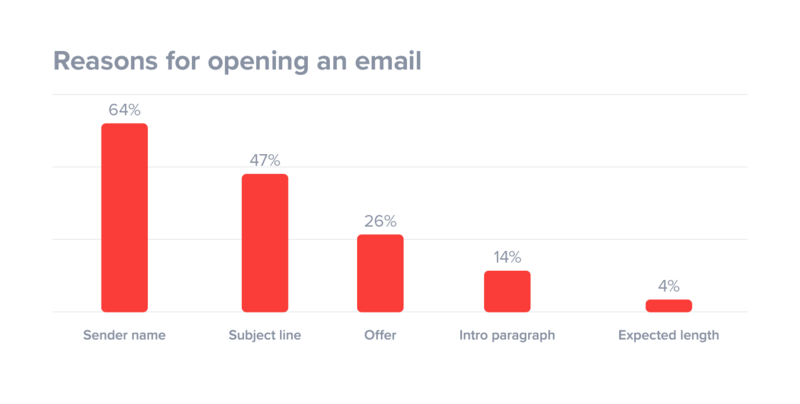 I think in this case, HubSpot need to update their copy to either "64% of people say they open an email because of who it is from", or to "47% of people say they open an email because of the subject line". Hi Steven, What a great article. I am currently doing research on the effect of personalization on the CTR. Do you think I can measure the effect of a personalized subject line on the CTR? Since it probably will cause a higher open rate, would this lead to a higher CTR as well? Or would you prefer to measure the effect of the subject line on the open rate? Hi Lin, Thank you! There's a lot of research out there that proves personalization in subject lines can increase CTR. I'll be working on a follow up post to this article that covers everything CTR related. Stay tuned! Thanks for the comment, Joseph. I recommend running a test using two variations to see which subject line generates higher email open rates. Hi Steven, I'm a content marketing writer for a B2B company that markets industry trade shows around the world. We do a hefty amount of email marketing to get attendees to register, and get exhibitors to showcase their products. This article is full of good insights and links. Thank you. Question: the data seems to be up-to-date but some of the comments are from years ago. Is this an article you continue to update? Hi Kate. Thanks for the comment. Glad you found it useful. Yes, that's correct. I continue to update it based on new data that is published. Hi, thanks for the article. Ive just started experimenting with emails. I sell websites to European clients from South Africa. Web design is very expensive in Western Europe and we are able to offer a world class service at half the price. But calling becomes expensive from SA abroad when you consider the amount of cold calls needed to get some good deals. I was thinking of personalizing each email to look as if it is directly aimed at the specific company. So it doesn't look like a random marketing email that I've banged out to a thousand co's. Would you be able to comment or recommend anything? That's a great idea, Adam. I suggest including personalization in their name, company name and location (city). And, if you have clients from big cities, like Cape Town or Johannesburg for example, then include their logos or quotes in the email as social proof for when you send an email to prospects in those cities. Thanks for the article. It helped me a lot! I have encountered the same problem - people won't read my emails, especially millennials. Was trying everything and in the end of my email adventure, I had a ~45% open rate. Now I am experimenting with communication through Facebook messenger. Open rates are much higher than with emails. I highly recommend to check this out. Hi Steven, Thank you for the great article. I was hoping to use your graph data "open rate benchmark by year" for a presentation with attribution, would this be acceptable? Hi Kristy. Of course, you are more than welcome to use the "open rate by benchmark by year" chart, or any other chart featured in this article. Good information. What type of program are the open rates for? And what type of audience, B2B? Hi Jeff, great question! As each study differs, I'm sure it's a combination of programs and audiences. Hi, I was looking for some email marketing guides like this and found that this piece on email clickthrough rates is the most amazing guide, with insights and a case study! Thanks for this, Regards! Just wondering if you think personalized send time optimization is worth the effort. e.g. A customer opens the most emails between 4pm and 5pm on Tuesday so when we send an email on Tuesday we should send emails to him close to 4pm. We identify the ideal send time for each day for each customer. If they do not have enough opens data for a day we do not use STO on that day. We have been trialing this and have only seen a small increase in open rate (from 0.5 to 1.0%) where the overall open rate is around 40%. Hardly seems worthwhile given the cost and effort involved to implement the STO. 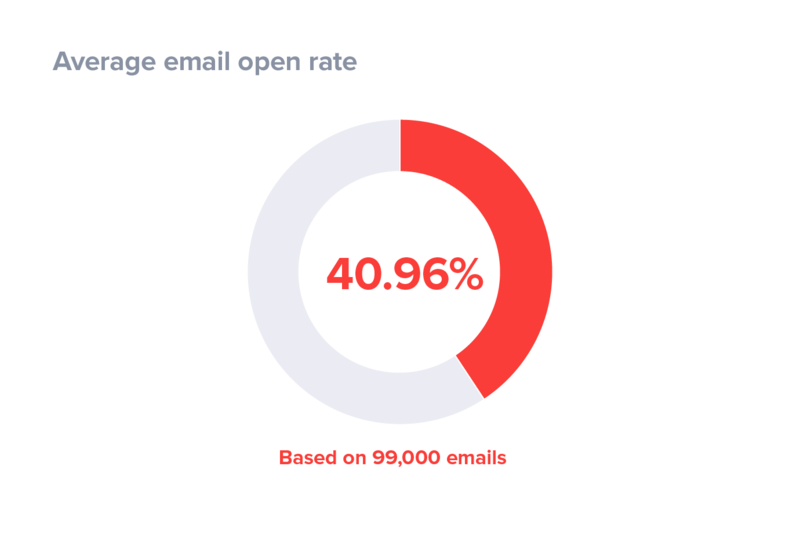 The open rate is fairly high given we can only do STO with people who are already openers; we need enough opens to allow us to identify the time they open the most emails. What do you think? Great point, Michael! How much testing have you done with email segments? You might get different results based on the segment and send out times. Hi Steven, Your article provides very nice info on email open rates, thanks for sharing it with everybody! I am convinced that this article is relevant for any business, in order to help them become successful in email marketing. Very instructive and great anatomical structure of email marketing subject matter, that's also user pleasant. Thank you! Great article! For me, newsletters sent out midweek yield the best results. However, rather than daytime, I usually send it in the evenings. Thanks, Helena! That's great feedback, and something I may have to try for myself. Email marketing, if done in a productive way, can be hugely profitable. Thank you for this informative article, it will help to boost open rates and reach my audience effectively.